Will be released in January in an interesting and unexpected way. A few months ago, Cassie teased fans with a short peek at the final cover before sharing its rather cruel placeholder. Fans of Cassie will probably vividly remember revealing the cover of Clockwork Princess by sending tweets with the hashtag #ClockworkPrincess. 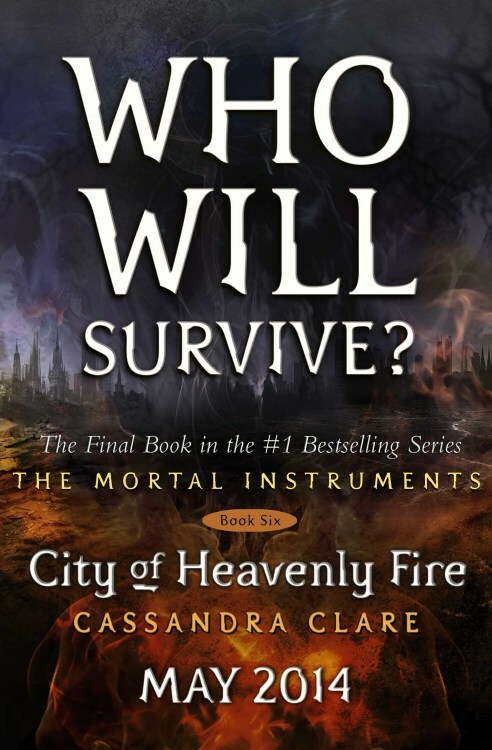 Do you think the fans will be involved again or can you think of any other way to reveal the final cover in The Mortal Instruments series? Sound off in the comments. i just want it now!!!!! wahhhh!!! I have a feeling that it will be involved with the City of Bones DVD! But that’s been out for a while now. OMG!!!!!!!!! I need those book!!!!!!!!!!!! I wonder what she means by “in an interesting and unexpected way” ? Yay!!!! and my god the Doctor looks hilarious. You just HAD to use a gif with Matt Smith as the Doctor, didn’t you? On-topic: Can’t wait for the cover. Why can’t they just release it already?! On a website like a Puzzle thing Using Hashtags for twitter and share on facebook til reach one amout and it will be revealed slowly! Knowing Cassandra Clare it could be anything. I hope it involves the fans and having us do something to reach the goal of seeing the cover. I hope she will also do the same thing with CoHF as she did with CP2 where she slowly reveals the first chapter. this has to do with the announcement of City of Ashes filming????????????????????????????????????????????? They said they’re gonna start in 2014!!!!! EEEEEPPPP I’m so excited! I can’t breathe! Oh my gosh! oh my gosh I want to read this so bad I mean i’m gonna go CRAZY!! it looks good the other books are great too I’m so excited!! !